Foreign exchange (FX) risk is invariably associated with import and export transactions when future payments are denominated in a foreign currency. Pricing in the currency of the target market require special expertise in analyzing and managing FX risk. More and more institutions recognize the need to manage this kind of risk using derivatives as insurance. Insurance is none profitable derivative transaction to eliminate subsequent adverse currency movements. This hedging transaction costs money and of cause substantial upfront cash flows costs (premium) discourages many would be users. The drive for premium redaction or even elimination has resulted in the growth of different options strategies based on the idea of writing an option whose premium finances the purchase of another option (insurance). Each of an option combination is structured for a specific risk profile and in order to suit corporate requirements such combinations must hedge or manage FX exposure. There are plain vanilla (basic) and exotic options. Both of them are classified according to their complexity. •	Second generation options consist of a combination of purchased and written option with the same maturity date and adjusted strikes to compensate the reduction of premium payment. •	Third generation options are more sophisticated having purchased and written options with different maturity. It can be said that second and third generation options add additional features to the first generation options. Exotic options are also classified by the principle of their complexity and can be used to achieve premium reduction. The net effect is a zero cost package or at least reduced premium. While a bought option is just a simple insurance, a written option is simply obligation under special market circumstances. Therefore these packages can be viewed as synthetic forwards. A large EU company exporting to the USA. The company will receive $1 million revenue in a 3-months period. 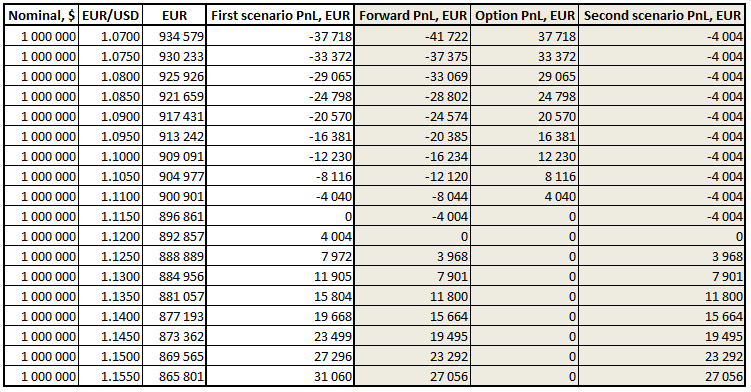 Clearly, there is FX risk in that the company will lose money from an increase in euro (while dollars will fall), i.e. EUR/USD increase. 3. Buy a call option with strike 1.1150 and pay upfront premium. This scenario is not appropriate because the company doesn’t have any money to pay the upfront premium. The second scenario hedges the company against euro appreciation as well and gives possibility to reduce losses in case of dollar appreciation. Instead of selling $1 million dollars at the current 1.1150 3-months EUR/USD forward rate the company agrees to sell at the 1.1200 forward rate that is really worse. The difference is $0.005 which is the premium of the EUR/USD put option. The premium is embedded into the forward strike (which should be 1.1150 forward rate but due to the premium is 1.1200) and therefore is not payable. The second scenario gives a call option payoff, this is a synthetic call option as written in the article. Now it is obvious that the effect of a Boston option is to obtain a currency option (insurance) and to defer the payment of the premium (for this insurance) until maturity of the option. The deferral is the main factor why a Boston option differs from a simple plain vanilla call option. Other strategies will be explained in the future articles.